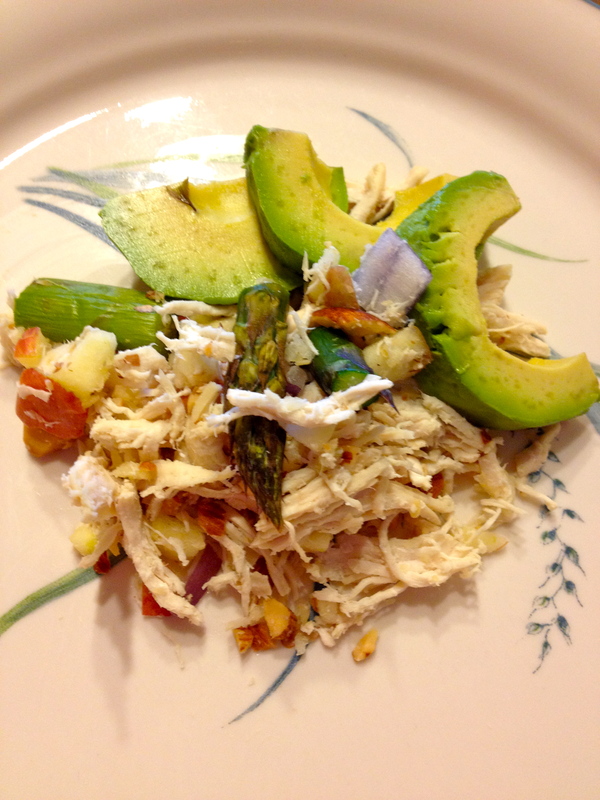 This is the best chicken salad I have ever had! I found it on Pinterest, from multiplydelicious.com. I highly recommend the site, it is full of recipes! One of the main reasons I like this so much is there is no mayonnaise or miracle whip… Her recipe includes a sauce to mix into the salad, but I do not even use it because the chicken salad is so good on its own. Note: I changed the recipe to my tastes. 1. Put the bay leaves and the chicken broth in a large pot with a lid and bring stock to a simmer. Add the chicken breasts and cover. Let the chicken cook in the stock for 30-45 minutes. Note: This is after they had cooked for 45 minutes and most of the broth had evaporated, they should be almost covered when first placed in. 2. While the chicken is cooking, chop the other ingredients – garlic, almonds, onion, asparagus (I put the asparagus in oven at 350 degrees for about 10-15 minutes before adding), basil, parsley, and add to a large bowl. Sprinkle with a little salt and pepper. 3. 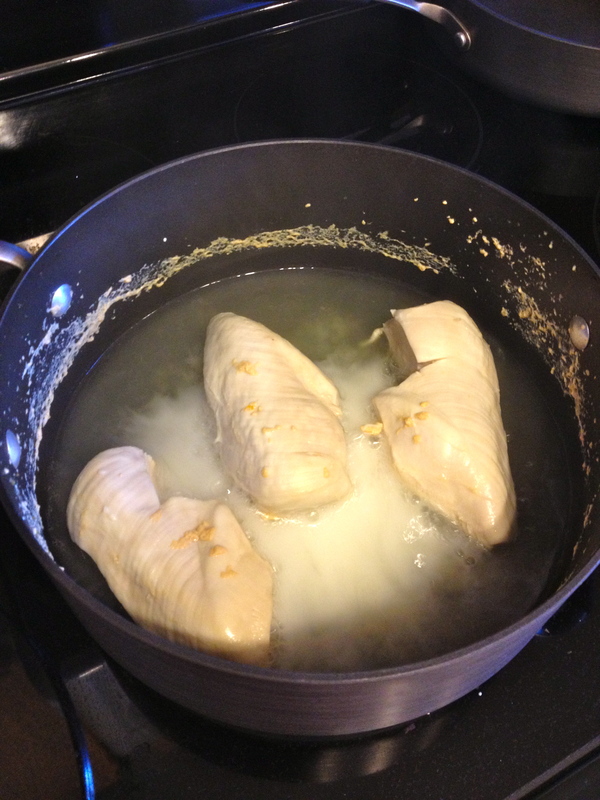 When the chicken breasts are cooked, remove them from the broth and let them cool. 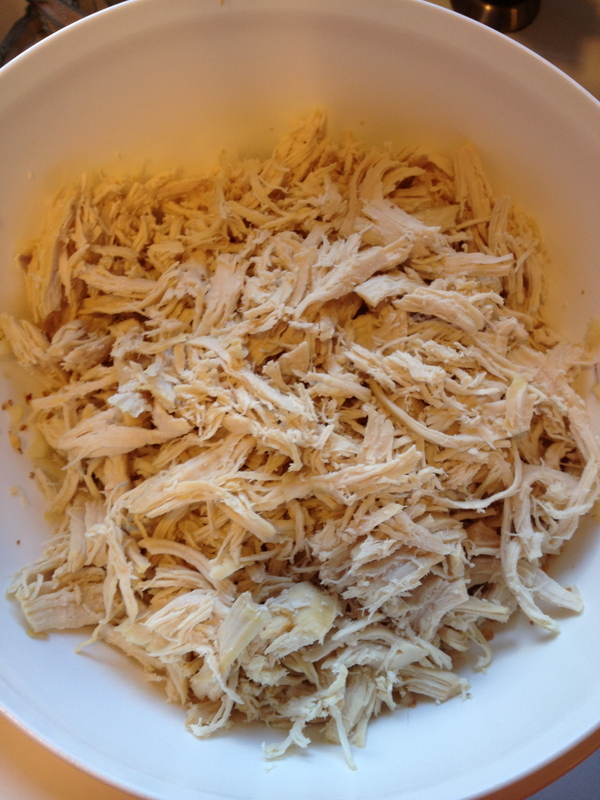 When they are cool enough to handle, shred the chicken breasts into bite-size pieces by hand. Mix the chicken pieces in with the rest of the ingredients. 4. In a food processor combine parsley, basil, apple cider vinegar, mustard, garlic, and salt. While food processor is running slowly add olive oil in a small drizzle. You may have to stop the food processor to scrape the sides. You want the mixture to come to a liquid consistency. Add fresh ground pepper to taste. I prefer the avocado, in lieu of any sauces… however I have tried the sauce and do like it. 5. 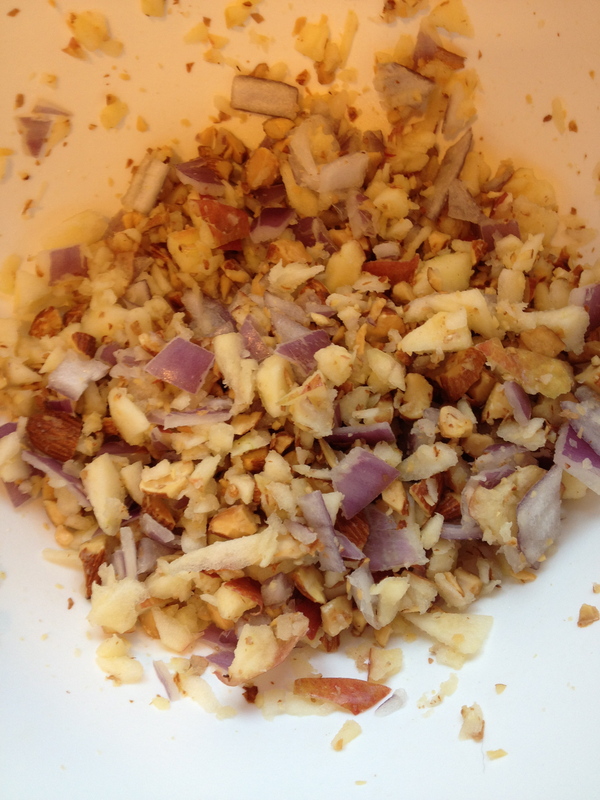 Add dressing to chicken salad and toss to combine.